Jordan Grand Prix was a Formula One constructor that competed from 1991 to 2005. The team is named after Irish businessman and founder Eddie Jordan. Jordan and his team were well known for an easygoing attitude which added colour and character to Formula One in the 1990s. The team was based at Silverstone, UK but raced with the Irish licence. In early 2005, the team was sold to Midland Group, who competed for one final season as 'Jordan', before renaming the team as MF1 Racing for the 2006 season, before being sold later in 2006 to Dutch car manufacturer Spyker to become Spyker F1 for 2007, and then sold again to become Force India in 2008. In 2018, as a result of the financial collapse of the Force India team, and its subsequent buyout by a consortium led by Lawrence Stroll, the team's FIA entry was not transferred, and the Jordan Grand Prix's original entry was finally excluded from the sport. Eddie Jordan, who was bitten by the karting bug in Jersey in 1970, had a brief stint as a race driver in the late 1970s before founding Eddie Jordan Racing in the early 1980s. The team first came to prominence in the 1983 British Formula Three championship with a duel between one-time Jordan test driver Ayrton Senna and Jordan-Ralt driver Martin Brundle. Brundle was edged out by the Brazilian at the last round of the championship. The team graduated to International Formula 3000 for 1988, winning its first race in the category with Johnny Herbert. In 1989, Jordan won the F3000 drivers' championship with future Formula One star Jean Alesi. The team also ran future F1 drivers such as Martin Donnelly and Eddie Irvine in F3000. Jordan's success in lower formulae inspired the creation of a Formula One programme for the 1991 season and a change of name to Jordan Grand Prix. The first driver to test a Jordan F1 car was veteran Ulsterman John Watson. Jordan hired Italian veteran Andrea de Cesaris and Belgian Bertrand Gachot to race his first cars, which were powered by Ford. The team had a very solid debut finishing 5th in the Constructors' Championship, with de Cesaris finishing 9th in the Drivers' Championship. De Cesaris ran second for much of the Belgian Grand Prix, and was actually gaining on leader Ayrton Senna until the car failed in the closing laps. Gachot failed to end the season after being sent to prison for attacking a taxi driver. Gachot was replaced for the Belgian Grand Prix by Michael Schumacher, for whom the team received $150,000 from Mercedes-Benz who were keen to give their young German sportscar star experience of Grand Prix racing in readiness for the firm's future F1 ambitions. Despite Jordan's signed agreement in principle with Mercedes for the remainder of the season, Schumacher was signed by Benetton-Ford for the following race. Jordan applied for an injunction in the UK courts to prevent Schumacher driving for Benetton, but lost the case as they had not yet signed a contract. Future Champ Car title winner Alex Zanardi and ousted Benetton driver Roberto Moreno filled the second car afterwards. Success for Jordan literally came at a high price. The team was forced to switch to cheaper Yamaha engines for the 1992 season. With Maurício Gugelmin and Stefano Modena driving, the team struggled badly and failed to score a point until the final race of the season. 1993 saw further changes, with the team again changing engine suppliers, this time to Hart. Again, the season started with two new drivers, Ivan Capelli and Brazilian rookie Rubens Barrichello. Capelli left after two races and Barrichello saw five other drivers become teammates of his during the 1993 campaign. Jordan only had moderate improvement, scoring three points. Signs of stability were beginning to show near the end of the season when Barrichello was joined by Eddie Irvine, a former Jordan driver in F3000. The Ulsterman finished sixth and secured a point on his debut Formula One race at Suzuka. It was further memorable because Irvine unlapped himself against McLaren's Ayrton Senna, in order to overtake Damon Hill. After the race finished, an incensed Senna, infuriated by what he deemed as unsafe racing by Irvine in poor weather conditions stormed into the Jordan garage and punched Irvine in the face after Irvine pushed him in a heated discussion in which both drivers lost their temper. Barrichello and Irvine returned for the 1994 season, as did the Hart engines, but Irvine had a bad start to the season, earning a three-race ban for reckless driving. Barrichello earned the team their first top three finish in Japan at the Pacific Grand Prix, but was nearly killed during the following race in San Marino following a frightening qualifying crash. The team overcame these difficulties and returned to their initial form as they finished fifth in the Constructors' Championship again. Barrichello earned Jordan's first pole position after a gamble during a wet qualifying session in Belgium, and finished 6th in the Drivers' Championship with 19 points. This achievement stunned the Formula 1 big teams given the fact that a team with such a low budget with an engine designed and built by Darrell O'Brien/Hart Engineering achieved 5th in the Constructors' Championship with 28 points. Jordan switched to Peugeot power in 1995. During the Canadian Grand Prix that year, both Barrichello and Irvine finished on the podium, finishing second and third respectively. It was the highlight to an unspectacular but relatively solid year for Jordan, as they hung around mid-pack to finish 6th in the Championship. When Irvine left in 1996 to become Michael Schumacher's teammate at Ferrari, Jordan replaced him with veteran Martin Brundle, the ex-Le Mans winner and World Sportscar Champion. The team failed to make the podium, but both drivers managed to score a string of fourth-place finishes as the team scored yet another 5th among the constructors. 1996 also saw the team adopt their bright-yellow color scheme which would become their trademark. Jordan introduced nose arts from 1997 to 2001, their snake mascot Hissing Sid in the first year. 1997 saw the departure of both drivers from the previous year. Barrichello left for the newly formed Stewart Grand Prix, whilst Brundle became a Formula One commentator for ITV. Jordan replaced them with Italian Giancarlo Fisichella, who had raced for Minardi the previous year, and young Ralf Schumacher, Michael's brother. Again, the team finished 5th in the Championship, with Fisichella achieving two podium finishes. At Hockenheim, Fisichella had led the race, but lost out to Gerhard Berger before retiring when a puncture holed his car's radiator. The Italian's other highlight was scoring the fastest race lap at the Spanish Grand Prix. A lowlight of the season came in Argentina when Ralf Schumacher took out his Italian teammate during the race, which was tempered by Ralf's first podium. In 1998, the team made its biggest signing as former World Champion Damon Hill, a graduate of Jordan's F3000 programme, replaced Fisichella. The team also replaced its Peugeots, which went to Prost, with Mugen Honda motors. Up to the halfway point of the season, Jordan had failed to score a single point due to reliability problems. At that point, they signed Mike Gascoyne from Tyrrell to bolster the technical team and long-standing technical director Gary Anderson resigned a few months after. Things improved greatly towards the end of the season and at that year's rain-soaked Belgian Grand Prix in which only six cars finished, Hill earned Jordan their first ever Formula One win, which was also Hill's 22nd career Grand Prix victory. Ralf Schumacher sweetened the victory by finishing second. Hill finished 6th in the drivers' standings with Ralf 10th. Hill's last lap, last-corner move on Heinz-Harald Frentzen at Suzuka enabled him to finish the race in fourth and also earned Jordan fourth in the Constructors' Championship for 1998 (this was tempered by speculation that Frentzen had "gifted" the place to Hill, the German having confirmed a move to Jordan for 1999, after a tumultuous career with Williams). The 1999 season was Jordan's most successful in F1, with Heinz-Harald Frentzen winning two races. The team finished third in the Constructors' Championship. With Frentzen and Ralf Schumacher swapping teams for 1999 (Frentzen at Jordan and Ralf at Williams), the season would turn out to be a nightmare for Hill, who was to retire at the end of the season. However, Frentzen's season was immensely successful, with the German earning two victories and a pole position. For a short while Frentzen had entertained thoughts of a world title, but poor luck and greater speed from McLaren and Ferrari ended his hopes. Frentzen finished third in the Drivers' Championship and the team also finished third amongst the Constructors'. 1999 was to be the team's finest season. For 2000 Hill was replaced by Jarno Trulli, fresh from a couple of years at Prost and Minardi. His qualifying speed in particular impressed, but he was unable to score a podium. Frentzen was unable to replicate the success of 1999 and the team slipped back to 6th in the Constructors' Championship. The team had been on course for major points at Monaco, but poor luck intervened: Trulli was ahead of eventual winner David Coulthard until his engine expired, while Frentzen running in second place hit the wall at Sainte Devote with only eight laps to go. Both drivers returned to start 2001 and Jordan switched to works Honda engines which were already being supplied to rival team BAR. This led to a battle for the right to use the Honda engines in the long term. Frentzen was released from the team in mid-season, a series of disagreements with team boss Eddie Jordan a possible explanation. Jordan himself has said that he dropped Frentzen to bring in Takuma Sato for 2002, an attempt to satisfy Honda. Frentzen was replaced by test driver Ricardo Zonta at the German Grand Prix, but from thereafter Jean Alesi, in the final stages of his Formula One career, took the seat. Amidst all the turmoil, Trulli finished in the points four times, and the team finished 5th in the Constructors' Championship for the fifth time, ahead of rivals BAR. Takuma Sato driving for the Jordan Grand Prix team at Indianapolis in 2002. Jordan re-organised in 2002, with Fisichella returning and Takuma Sato joining the team, thanks in no small part to Honda's influence. Due to a drop in sponsorship money the team slipped backwards. Fisichella often qualified well, a sixth place on the grid in Montreal surprising many onlookers. Yet results-wise, the Italian had to make do with a trio of fifth places and a sixth place from Hungary. Sato showed flashes of promise, but managed just two points at his home race. Despite the drop in form, Jordan still managed sixth in the championship, two places ahead of main rivals BAR. For 2003, Honda left Jordan to concentrate on their partnership with BAR. Jordan had to make do with Ford Cosworth engines, and the season was not regarded as a success. Despite beating only Minardi to score 9th in the standings, Jordan won in 2003. This came under bizarre circumstances in the Brazilian Grand Prix which took place in heavy rain. Following a massive accident on the start/finish straight, the race was red flagged and stopped. After some initial confusion, Giancarlo Fisichella was initially ruled to have finished second behind Kimi Räikkönen who took the top step on the podium. However, an FIA inquiry several days later led to Fisichella being officially declared the winner of his first F1 race. Fisichella was therefore unable to celebrate his first career victory on the top step of the podium, although he and Räikkönen swapped their drivers' trophies in an impromptu ceremony at the following race in San Marino, while McLaren's Ron Dennis handed over the constructors' trophy to Eddie Jordan. Aside from the opportunistic win, neither Fisichella nor rookie teammate Ralph Firman were able to achieve any sort of success in their EJ13s. After Firman was injured in practice for the Hungarian Grand Prix Jordan fielded the first ever Hungarian Formula One driver, Zsolt Baumgartner. Firman returned for the final two events, but was unable to add to the point he won in Spain. Fisichella only managed two points on top of his victory and unhappy at the team's form he departed for Sauber. In June 2003 Jordan sued mobile phone company Vodafone for £150 million, claiming that the company had made a verbal contract for a three-year sponsorship, then given it to Ferrari instead. Jordan withdrew the action two months later, agreeing to pay Vodafone's costs. This was a double financial blow from which the team did not recover. The judge was highly critical of Eddie Jordan, branding the allegations against Vodafone "without foundation and false". Nick Heidfeld driving for Jordan at the 2004 Canadian Grand Prix. In 2004, Jordan struggled financially, and their status for the future was questionable. The team fielded German Nick Heidfeld, formerly of Sauber and Prost, and Italian rookie Giorgio Pantano. Ex-F3000 champion Heidfeld showed promise, but could not achieve many good results due to the car's initial pace being poor. Pantano's season was dogged by sponsorship problems. He missed Canada due to a lack of funding, with Timo Glock stepping in to replace him. Glock managed to score two points on his debut, finishing just ahead of Heidfeld, although these had been earned after the two Toyota and Williams cars had been disqualified for brake duct irregularities. Later in the season, Glock replaced Pantano permanently. As in the previous season, the team finished ahead of only Minardi at the bottom of the constructors standings. After Ford's decision to put Cosworth up for sale, Jordan had been left without an engine deal for 2005. However, at short notice, Toyota agreed to supply Jordan with engines identical to those in the works Toyota cars. At the beginning of 2005, the team was sold to the Midland Group for US $60 million. Tiago Monteiro at the 2005 United States Grand Prix. The Jordan name was retained for the 2005 season, before being changed to Midland MF1 Racing for the 2006 season. Throughout 2005, journalists questioned whether Midland were in Formula One for the long haul. Rumours circulated throughout the season that the team was for sale, and that former driver Eddie Irvine was interested in buying them. The year also saw the debut of two new rookie drivers, Narain Karthikeyan and Tiago Monteiro. 2005 merely confirmed Jordan's status at the back of the grid. A final podium came in the highly controversial race at Indianapolis, with Monteiro leading home a Jordan 3–4. Monteiro managed an excellent eighth place at Spa in wet conditions to give the team its last ever point. The final race for the team saw a low-key exit, with Monteiro finishing 11th and Karthikeyan crashing out spectacularly. Over the years Jordan introduced many star names to the sport, something that will not be forgotten. Jordan also has a link with the leading German drivers of the era, with Michael Schumacher, Ralf Schumacher, Heinz-Harald Frentzen, Timo Glock and Nick Heidfeld all driving for the outfit. From 1996 to 2005, Benson & Hedges was the primary sponsor of Jordan. 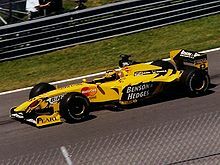 At races where the ban on cigarette advertising was in force, the name was replaced by "Bitten & Hisses" (in 1997 when Jordan's mascot was the snake Hissing Sid) or the names of the team's drivers, Giancarlo Fisichella and Ralf Schumacher, with additional 'S's, "Buzzin Hornets" (while the mascot was an unnamed hornet from 1998 to 2000), "Bitten Heroes" (during 2001, when the team's mascot was a shark), and from 2002 to 2005 'Be On Edge' (BENSON & HEDGES). It was in the sponsor's first year that the team coloured their cars in the gold of their cigarette packet and then switched to yellow after that. For 2002, title sponsorship went to delivery company DHL, before reverting to Benson & Hedges. EJ-10 was an energy drink marketed by the Jordan Formula One team. The energy drink was heavily advertised as free of caffeine and taurine to avoid a sugar crash, and as having a fruity flavor and providing energy for up to 90 minutes. It was sold in bright yellow 250 mL and 380 mL bottles, decorated to evoke the image of Jordan's Formula One cars. Jordan Grand Prix used the Sutherland Hawes design agency to create and market the energy drink. At the height of its popularity EJ-10 was available around the world, including Ireland, Germany, Colombia, Ecuador, Saudi Arabia, and Mexico. In 2002, the 380 ml bottles of EJ-10 were recalled in Ireland after it was discovered it contained unacceptable levels of benzene. V-10 is a spinoff of EJ-10; it retains the basic formula but adds vodka. A number of books have been published that gave an insight into Jordan Grand Prix. The most in-depth was the 1994 book Race Without End. Written by F1 veteran Maurice Hamilton, it tells the story of Jordan Grand Prix's 1993 season. Wikimedia Commons has media related to Jordan Grand Prix. ^ "Force India allowed to keep prize money". Wheels. Retrieved 2018-09-04. ^ Jordan, Eddie (2007). An Independent Man. Orion Books. ISBN 978-0-7528-8950-4. ^ Collings, Timothy (2004). The Piranha Club. Virgin Books. p. 17. ISBN 0-7535-0965-2. ^ Collings, Timothy (2007). The Piranha Club. Virgin Books. Chapter 1 'Welcome to the Piranha Club'. ISBN 1-85227-907-9. ^ "Ayrton Senna Suzuka 1993". Themagicofsenna.com. Retrieved 2014-02-04. ^ "Gascoyne joins Jordan". atlasf1.com. Retrieved 2018-02-06. ^ "Gary Anderson Leaves Jordan GP". Motorsport.com. Retrieved 2018-02-06. ^ "Judge criticises Jordan lawsuit". BBC News. 2003-08-04. Retrieved 2010-10-04. ^ Maurice., Hamilton, (1994). Race without end : the grind behind the glamour of the SASOL Jordan Grand Prix team. Sparkford: Patrick Stephens. ISBN 1852605006. OCLC 30914440.